CHICAGO, May 03, 2018 (GLOBE NEWSWIRE) -- Allscripts (NASDAQ:MDRX), a global leader in healthcare technology, today announced that it signed a definitive agreement to acquire HealthGrid Holding Company, a mobile enterprise patient engagement platform business. The agreement represents a significant expansion of the Allscripts FollowMyHealth® platform portfolio, the company’s patient engagement solution focused on connecting patients with providers. 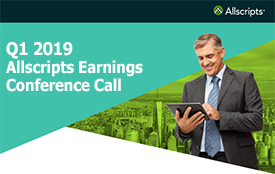 Allscripts expects to close the acquisition in the second quarter of calendar 2018, subject to the satisfaction of customary closing conditions, including the expiration or termination of the waiting period under U.S. antitrust laws. HealthGrid is a leading mobile, enterprise patient engagement solution that has helped independent providers, hospitals and health systems to dramatically improve patient interactions and satisfaction. The growing adoption of value-based care combined with the modest level of usage of patient portals across the healthcare industry (as low as 30% in hospital-owned practices, and 10-15% in physician-owned practices) has made it critical for health IT to bring an enhanced approach to patient-engagement solution design. Upon closing of the strategic acquisition, Allscripts expects to tightly integrate the HealthGrid capabilities into its FollowMyHealth platform, adding functionality that would enable providers to reach 100% of their patient populations without requiring patients to sign up for a portal. Instead, the new functionality will leverage existing patients’ contact information. By continuing to grow usage of FollowMyHealth and helping connect providers with patients outside the portal as well, Allscripts will help providers greatly increase their outreach to patients and boost patients’ engagement in their own health. This expected advancement of the FollowMyHealth platform further drives Allscripts strategy to offer the most comprehensive patient engagement solutions and enable providers to stay connected with their patients in pre-care, point-of-care and post-care settings, helping care teams to collaborate with patients in real time across the continuum. Driven by a complex rules engine based on clinical protocols, integrated functionality would enable intelligent outreach by providers to connect to patients at the precise, optimal time in the care process, keeping patients engaged, informed and supported throughout their care experience. Additional, enhanced capabilities Allscripts plans to introduce to FollowMyHealth upon closing of the acquisition include appointment confirmation and waitlist notification functionality, post-discharge surveys, and more robust tools to assist providers in meeting critical regulatory requirements. "Adding these significant capabilities to our portfolio, further growing our FollowMyHealth platform, will benefit our clients and their patients, as our robust offering will create opportunities to reach new heights of patient outreach and engagement," said Allscripts Solutions Development Executive Vice President Jim Hewitt. "Additionally, it advances our EHR-agnostic approach. You don’t have to have an Allscripts EHR to make this work. Engaging consumers in their own health is critical to achieving a healthier tomorrow, and enabling meaningful connections between patients and providers is a crucial piece of fostering successful healthcare delivery. It’s a role Allscripts is proud to play—to improve the way patients engage with their own health and their clinicians is to fuel the progress of healthcare itself." This press release contains forward-looking statements, within the meaning of the Private Securities Litigation Reform Act of 1995, that involve risks and uncertainties. Forward-looking statements provide current expectations of future events based on certain assumptions and include any statement that does not directly relate to any historical fact or pattern. Forward-looking statements can also be identified by the use of words such as "future," "anticipates," "believes," "estimates," "expects," "intends," "plans," "predicts," "will," "would," "could," "can," "may," and similar terms. Forward-looking statements are not guarantees of future performance. Actual results could differ significantly from those set forth in the forward-looking statements, and reported results should not be considered an indication of future performance. Certain factors that could cause our actual results to differ materially from those described in the forward-looking statements include, but are not limited to: the timing or ultimate completion of the acquisition of Health Grid, as the transaction is subject to certain closing conditions, including the expiration or termination of the waiting period under U.S. antitrust laws; the possibility that expected benefits may not materialize as expected; the expected financial contribution and results of the Health Grid business; the successful integration of the Health Grid business; and the anticipated and unanticipated expenses and liabilities related to the acquisition and the acquired Health Grid business. Additional information about these and other risks, uncertainties, and factors affecting Allscripts business is contained in Allscripts filings with the Securities and Exchange Commission, including under the caption "Risk Factors" in the most recent Allscripts Annual Report on Form 10-K, in subsequent Form 10-Qs and in our Form 8-K regarding the pending Health Grid acquisition to be filed with the Securities and Exchange Commission under the heading "Forward-Looking Statements and Risk Factors." Except as required by law, Allscripts does not undertake to update forward-looking statements to reflect changed assumptions, the impact of circumstances or events that may arise after the date of the forward-looking statements, or other changes in its business, financial condition or operating results over time.